Publicist Charlie Cinnamon died Thursday, Nov. 3, 2016 in Miami, just two days shy of his 95th birthday. 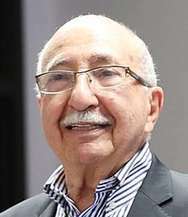 A fixture on the South Florida cultural scene since the 1950s, his clients included the Broadway Across America series, Miami City Ballet and the Cleveland Orchestra in Miami. For 26 years he was the spokesman for impresario Zev Buffman, who presented a 12-week theater series at the Royal Poinciana Playhouse in the 1980s. His honors include a 1983 George Abbott Award for Outstanding Achievement in the Arts from the Carbonell Awards. Cinnamon’s friends included not only his clients, but also luminaries such as Elizabeth Taylor, who at his request headlined a benefit for AIDS research in Miami that raised $2.5 million in a single night. A supporter of Miami City Ballet since its inception, he arranged for Princess Caroline of Monaco to grace a benefit for the company and the Princess Grace Foundation USA. Cinnamon was active to the end. As recently as September, he publicized a Public Relations Society of America endowment fund luncheon in Key Biscayne.